Motorcycle collision victims are often injured twice, first by the driver who hit them and then by the insurance company that refuses to treat them fairly. Many motorcycle collision victims have to deal with issues such as having to prove that they didn’t do something wrong, even when fault for the collision clearly lies with the other party. Insurance companies defend these claims by attacking the motorcycle, despite the fact that motorcycles are safe when handled properly. 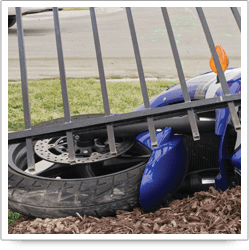 At Riley & Jackson, P.C., we handle motorcycle collision cases. We represent riders and passengers who are injured in motorcycle collisions throughout Alabama. We offer a free initial consultation to determine if you have a valid case. Many motorcycle collisions are caused by distracted drivers who either fail to see or fail to look for two-wheeled vehicles. Once the collision occurs, the driver of the car will often claim the motorcycle operator was speeding or driving unsafely. Unfortunately, many juries have a bias against motorcycle riders. Insurance companies take advantage of this by attempting to shift blame to the motorcyclist with the strategy of trying the case against the motorcycle itself. We collect evidence through witness statements and collision reconstruction to establish exactly how the collision occurred. Injuries suffered in motorcycle collisions are almost always serious and can involve life-changing issues such as traumatic brain injury. Our attorneys will hire the best experts to assess everything you will need for the rest of your life as a result of your injury, including future medical care, rehabilitation, therapy, wheelchairs, medications, personal services and home modifications. Our lawyers take very seriously our responsibility to help you recover the compensation to which you are entitled under the law for everything you have lost in the collision. For more information or to schedule an initial consultation with motorcycle collision attorneys, please call or send us an e-mail via this website.